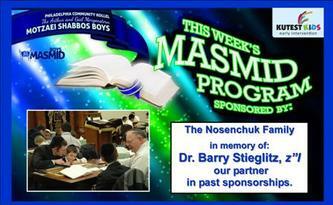 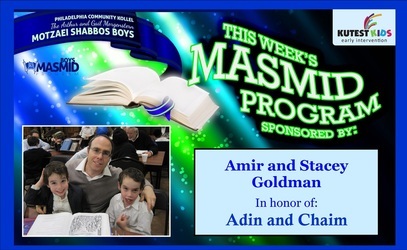 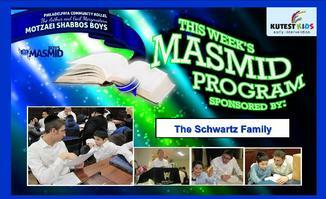 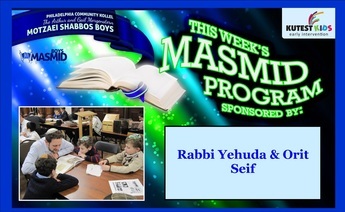 To sponsor a Masmid program in honor or memory of a loved one, please fill out the form on the Masmid Sponsorship Page. 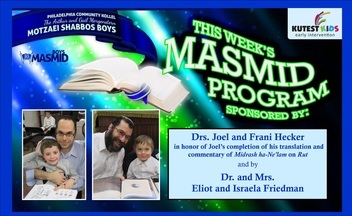 The cost for sponsorship is only $300 per week. 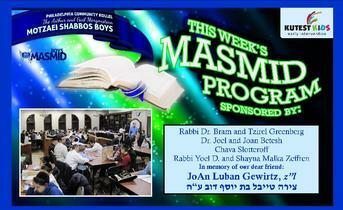 For questions and comments, feel free to contact Rabbi Zeffren at yoelz@verizon.net. Arthur Sauerhaft and Emily Coplon in honor of the yahrtzeit of Arthur's father, Dov ben Nosson Notah, z"l.
and in honor of Elisha becoming a big brother. in honor of their siyum on Mesechta Beitza. 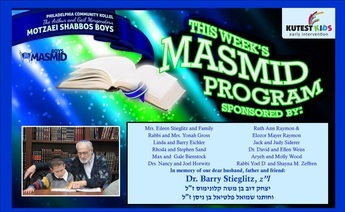 Harav Zelig Ben Harav Dovid, a"h.
Nachum and Dvasha Stollman and Family in memory of Nachum's mother, Chava Esther Fruma bas Rav Eliezer Yehudah, a"h.
in memory of Dr. Barry Stieglitz, z"l, their partner in past sponsorships.